This story was originally published on FordFund.org. Atomic Lab founder and inventor Gino Tubaro proves youth isn’t an impenetrable barrier to invention, entrepreneurship or community service. “From childhood, I started to imagine what I could invent with my ideas,” Tubaro said. At 12 years of age, the Argentinian invented a device that could recognize the difference between an appliance and fingers and would prevent electrocution by interrupting the current if fingers were touching an electrical outlet. His invention earned him AR$500 pesos and significant recognition from the World Intellectual Property Organization, a United Nations agency that promotes innovation and creativity that benefits all countries. Encouraged, Tubaro continued inventing. His creations include a wearable device that recognizes letters in written text and translates them into braille in real time. At 16, Tubaro decided to construct a 3D printer from the spare parts of paper printers. The idea was to use the machine to prototype his inventions and try to create a company. The company would also sell the 3D printers Tubaro built. “After I had my machine, I wanted to go to forums and talks and showcase my projects,” he said. With one Facebook message, Tubaro’s plans changed and so did the lives of many. Argentina resident Ivana Gimenz didn’t have the $10,000 it would cost to buy a prosthesis for her son, Felipe Miranda, who was missing a hand since birth. She messaged Tubaro on Facebook to ask if he could use the printer to construct a prosthetic for Felipe. Tubaro based the prototype on a photo of Felipe and the knowledge that he would have limited movement. After getting direction from medical professionals, Tubaro and his colleagues figured out how to make it. A few months later, Tubaro sent the prosthesis by mail, as the inventors weren’t able to travel the 500 kilometers to deliver the device. Before long, Tubaro received photos of Felipe using it to hold a fishing pole and perform other valuable activities. Elated, the young inventor uploaded a video of Felipe and his new hand to the internet. The video was a hit. What’s more, his new company, Atomic Lab, gained notoriety. In 2015, the Massachusetts Institute of Technology (MIT) honored Tubaro as one of its Innovators Under 35. In 2017, Tubaro had a private meeting with then-President Barack Obama in Argentina. Gino Tubaro has since been able to deliver no-cost prosthetic limbs to children and adults who need them in Argentina, Mexico, and Brazil with the help of partners that include Ford Fund, Disney Mexico, the History Channel and prison inmates. The History Channel donated $60,000 to the Atomic Lab Limbs project in 2016. The funds went toward supplies, tools, virtual teaching sites and research and development. For Disney Mexico, Atomic Lab designed 60 brightly colored, superhero-themed prosthetics that movie stars distributed. A major boost to the nonprofit came after Tubaro tweeted that his nonprofit needed a vehicle to increase distribution. He hoped to work with automobile companies. Ford was the first to respond. “After going to many other motor companies, the only one we felt cared more about the community than selling the car was Ford,” Tubaro said. Avila met Tubaro in late 2017, when the young inventor returned from speaking at the London School of Economics. There, Tubaro discussed Project #Argentinatón, Atomic Lab’s mission to deliver as many prosthetic limbs as possible to Argentinians in need. Atomic Lab employed a donated Ford Ranger and Gino Tubaro’s solar-powered 3D printer to make and deliver prostheses at no cost to clients. Hook-and-loop tape makes the prosthetics adjustable, and plastic keeps the weight light. “We found a shared vision with Atomic Lab: Improve people’s lives by applying innovation and ingenuity to make accessible for them what they need to achieve it,” said Carlos Galmarini, institutional relations director of Ford Argentina. To start, Ford loaned the nonprofit a fully equipped Ford Ranger for the planned cross-country journey. Ford also provided extensive modifications – “options” – exclusive to the assignment. That wasn’t their only vehicle modification. They attached a dome, cables and solar panels to the exterior to power the 3D printers. “It takes five or six hours to print each part for the prostheses. The idea was to print them over the 500 kilometers between each town,” Tubaro said. They also produced common parts in advance of the journey. Volunteers at Ford’s Pacheco Stamping and Assembly plant in Buenos Aires helped assemble prosthetics for delivery. Using the Ford Ranger, Ford Fund and Ford Argentina helped Atomic Lab deliver nearly 200 prosthetic limbs around Buenos Aires. In all, Tubaro and his team were able to deliver more than 1,000 prosthetic devices to people in outlying towns. They also reached those in remote areas that even “post mail” cannot reach. At the end of the journey, Ford donated $40,000 and the Ranger so Tubaro’s vision could grow. Now, Atomic Lab is working to partner with 44 countries to deliver more prostheses to those who find cost a barrier. Next, Tubaro said, he wants to improve on the product with robotics and artificial intelligence. These technologies could improve the user’s ability to grab and hold objects. Oftentimes, youth have great ideas but don’t know the next step. The key is to make strong connections, said Sibrina Collins, executive director of the Marburger STEM Center. Part of Lawrence Technological University in Southfield, Michigan, the Center holds business pitch competitions for high school kids from faith-based organizations and an annual Shark Tank Entrepreneurship summer camp. Keith Young, founder of Ecotek Lab, a Michigan-headquartered, science-based research cohort for youth in Detroit, Baltimore and Orlando, sees common traits among young inventors – from their uninhibited creativity to the barriers of entry they face. “Kids are all looking for the same thing, an opportunity to explore,” Young said. Young, who advised enterprise systems for Fortune 500 companies as a consultant for Deloitte, started looking at the quality of education his own kids were getting. That’s when he developed Ecotek, what he calls “a YMCA for scientists” to create patentable products in myriad fields, such as material science, citrus greening and life science. Young said youth who don’t have a STEM Center or organization like Ecotek should look for mentors at maker groups or tech accelerators. Gino Tubaro, now 23 years old, hopes to be an inspiration to those around him by launching his own mentoring organization. 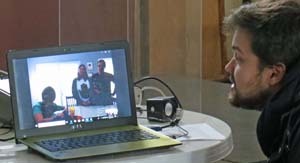 Inventor Gino Tubaro uses video chats to shorten the distance between himself and clients when he cannot visit in person. Tubaro’s League of Inventors incubator lab would teach kids – ages 6 to 16 – how to 3D print, use a computer numeric control (CNC) machine, code, laser cut, design and more through hands-on projects and workshops. “It’s his vision that more people like him will do these things around the world,” Ford Fund’s Avila said. As a result, Ford Fund created and developed the first Ford Fund Entrepreneurship Ambassador Award for Tubaro. The award will include a $25,000 donation to Atomic Lab and a visit to Detroit on June 16, 2019, where the young inventor will be keynote speaker at a special event. He also will be part of a judging panel and engage in the Ford Fellowship program that will bring about 20 entrepreneurs from around the world to Detroit.